Npackd is a free open source program for Microsoft Windows that brings package management known from GNU/Linux systems to Windows. It feels strange that Microsoft never integrated a package manager in the Windows operating system to give users and administrators a first-party tool at hand to find, install, or update third-party programs. Npackd is a free Windows package manager that assists administrators and users in discovering, installing, updating and uninstalling applications. Npackd, which is pronounced unpacked, queries a server on the Internet on startup to retrieve the latest application database. It populates a table with the data and displays the application's name, description, version and information whether the application is installed on the system. If the latter is the case, it checks whether the program was installed using Npackd or other means. The package manager can only manage files that have been installed from the application interface which means that it is not possible to update or uninstall programs that have not been installed using Npackd. A search form and filters are displayed on the left. It is for instance possible to only display installed or not installed applications. A click on the install button at the top installs any selected application on the system. Uninstalls and updates work in a similar fashion which means that is very comfortable to install, remove or update any number of supported applications using the program. The application list offers over 900 programs at the time of writing, of which some are listed with multiple versions. some of the popular programs include iTunes, 7-Zip, uTorrent, Wireshark, Imgburn, Foxit Reader, Firefox or Dropbox. All applications are freely available and don't contain toolbars, adware or other unwanted additions. The installation and uninstallation is completely automated and requires no user interaction. Programs are listed with status information, installed applications are listed as installed, updates are indicated with the update status and so on. A link to the homepage of each software is listed in the program database as well. A click on go to package page opens the homepage of the selected application in the default web browser. You can run the application from the command line as well. Use ncl help to display the command line help and use commands such as ncl add or ncl search to install programs or search for applications. 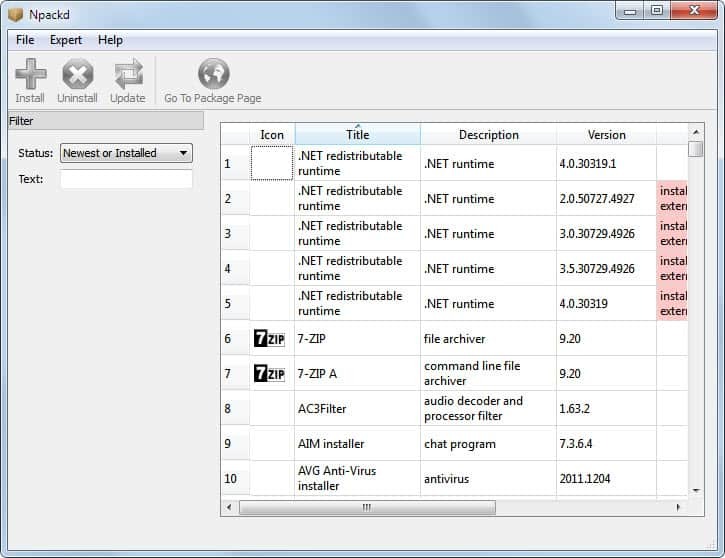 Npackd is a useful program for Windows to install and manage programs. While it is limited to about 900 programs right now, it does include many of the most popular programs for Windows so that these may be installed, updated or removed from systems Npackd is run on. It is currently not possible to selected multiple applications for installation. Options to display specific application categories or to create application profiles that can be exported and imported could improve the application further. I can’t find on their website or its possible ro redefine the place/position to instal,l the software with this program? Main second question is or you have to run this program continuously? Main third question if this program runs continuously does this program installs updates, automatically? Main fourth question is if the program updates automatically does it restart your system automatically, after the update? You can configure one installation path for all applications. That’s problematic, I agree. As the CEO of Allmyapps, an independent application store for windows, I find it interesting that to see new initiatives in this field. There’s a huge need for an easy way to discover and manage applications on Windows (if you want to try the beta version of allmyapps: http://allmyapps.com). However, I think that eye-candy is as important as features when designing an application and npackd has room for improvement on this aspect. It would also be great if the program could install dependencies, especially for those who like to make libraries for easier native development since that’s a major problem for windows apps creation.